Now that Uncanny Adventures has debuted, we’re going to take a few minutes to continue speaking with some of the great creators in our anthology to give you a taste of what you can expect. Jay Sternitzky and Ma teo Cantu are Denver-area creators whose pages tell the tale of a great tragedy. Their work for Uncanny Adventures — “Big Adventures of the Little Noa-Noa” — is the first story in our anthology. It’s a somber story of regret, but contains plenty of action and a brisk pace. (Trust us, it works.) Through his work with Paper Dream Productions Jay has honed his writing terrifically, and Mateo’s linework brings to mind vintage Todd McFarlane, although with cleaner storytelling and better anatomy. Mateo Cantu: Though I’m a product of two Marine Corps parents, I decided to go to college for graphic arts. My grandmother is the other artist in the family and always inspired me to be interested in drawing. I guess as a child I always had a knack for it and got very serious about drawing when I was young while reading comic books. Jay Sternitzky: I remember listening to Robert Kirkman do an interview well before THE WALKING DEAD hit it big and INVINCIBLE was the talk of the indie (super-hero) scene. Basically, in a few minutes, he broke down how and why – he had been reading comics his whole life and paid attention to how they worked – page turns, cliffhangers, etc. – he made comics. The overall theme I grabbed was “I’ve been reading these things for my whole life, I know how to do this…”. Then I bought Jonathan Hickman’s THE NIGHTLY NEWS #1 after hearing Tom Katers’ review on the ‘Around Comics’ podcast…made me change the way I thought about comics and what artists (writers/pencilers/colors/letterers) can do with the medium. 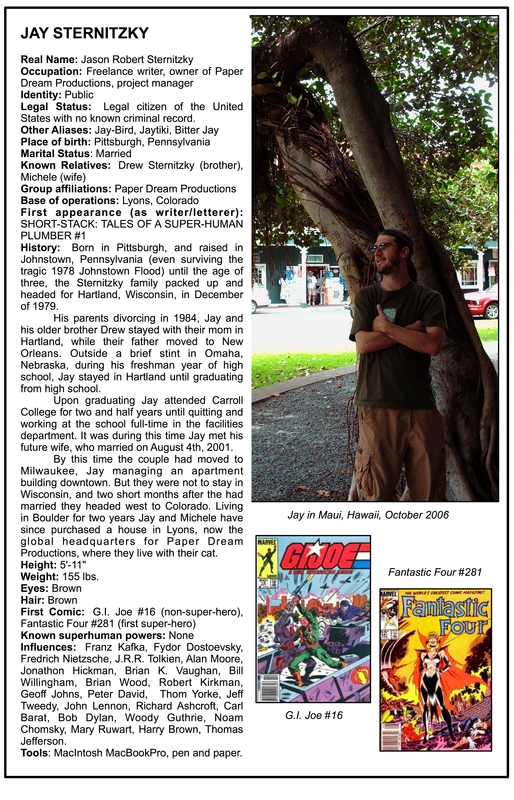 Then, about six years ago my brother, Drew Sternitzky, a gallery painter by trade, and I had always talked about doing something artistically together and it seemed we had found that opportunity, and thus, our first book came out, SHORT-STACK: TALES OF A SUPER-HUMAN PLUMBER. That and I guess I’m arrogant enough to think my ideas are worthwhile enough for someone else to take the time to read them. MC: In the late 80s and early 90s I started reading comics as a kid. 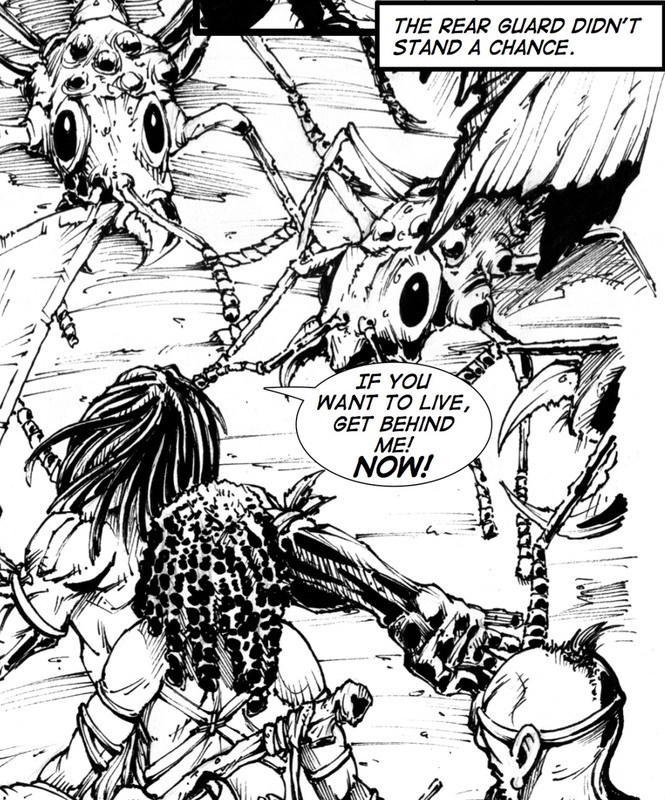 I loved reading Conan the Barbarian cause of the detail. I always seamed to enjoy the art of a book over the story. I remember getting mad when the cover art was better than the interior. Comic books taught me how to draw, by me replicating images. Around the same time that Image Comics started up I got really into drawing “super hero” art and even started doing my own pin-up pieces. My mom was really into comics at the time too and she had a lot to do with exposing me to so many different books. Without giving too much away, tell us about the story ” Big Adventures of the Little Noa-Noa” and howyou approached it. JS: I guess we’ll go with the approach first. Out of everything I have written this is the most ‘traditional’ in a comic sense. Mateo Cantu, the artist, and I wanted something that would be a nice spring board to future stories. Maximize the effort now in case it comes in handy later. So we came up with a ten-page, complete story, that gives us the opportunity to come back to the characters later. That said, this tale, ‘Terror In The Amazon’, introduces the Noa-Noa, a race of undiscovered humanoids living in the Amazon Rain Forest that stand, on average, 3/4″ tall. Our main protagonist, PATRE, is unlike all the other of his race – he stands an inch and a quarter tall, muscular, and their bravest warrior – and is put through an ordeal none of his kind has experienced before. The elevator pitch: The Smurfs meets Conan – and eventually, Game of Thrones, if we do more stories. MC: When Jay approached me with some ideas for this anthology, one of the concepts out of maybe three was described as “Conan the Barbarian taken place in the world of Smurfs” – I could not resist. MC: Currently I haven’t been reading anything. Not because I don’t want to but I simply don’t have the time. JS: I’ve been reading biographies on at the artists Francis Bacon and Marcel Duchamp. MC: I met Jay while he was promoting one of his books and we exchanged information, while talking about a possible project in the future. Creative process? I’m not sure how to answer that. I’ve been doing commercial/contract work for so long that I don’t get to just sit and do my own thing. I seem to do well being told what to do. JS: Well, I approached Mateo after Wayne Winsett, owner of Time-Warp Comics in Boulder, posted your open submission for the anthology on Facebook. After the great experience I had with Mateo doing out 24-Hour Comic Day story, GUMBLE THE SOBER OGRE, I asked if he wanted to pitch something. As a writer, and more importantly a collaborator, I asked Mateo what we was interested in drawing. Mateo, always being conciliatory, said he would draw whatever. I kept pushing for specifics and he was leaning towards the swords and sandals idea – not normally something I am interested in – but it gave me a fun challenge and I fell in love with our idea and the world we can fully bring to realization. As far as the complete collaboration, its really hands-on between us. Mateo did the panels individually, I dropped and arranged the pages and added or revised the text, and we sat down and talked about the final version. A really, nice, complete collaboration. A ton of fun, and different from every other book I have worked on, something I always look for in a new story and collaboration. What else is in the works for you, and where readers find your work next? JS: I recently launched a new web comic, ROLLO: NUCLEAR-POWERED PACIFIST ROBOT, with painter Rick Vanderheite over on my website, PAPERDREAMPRODUCTIONS.COM, which updates every Wednesday. There you will also find SHORT-STACK TALES OF A SUPER-HUMAN PLUMBER with wonderfully different art by Drew, that had our first collected edition come out last year. The whole thing is there for free, so please, go and check it out – 88-pages of story! You can also find the afore mentioned GUMBLE THE SOBER OGRE 24-Hour Comic Day story Mateo and I first worked on. And, of course, you can check out ‘Terror In The Amazon’ – our intro into THE BIG ADVENTURES OF THE NOA-NOA in the upcoming ‘8th Wonder Press Anthology’. Paper Dream Productions has taken a year off off our usually hectic Spring convention schedule, but come out and see us at this year’s Denver Comic Con and say hi, buy some books, prints, get a sketch from Mateo – and get your ‘8th Wonder Press Anthology’ signed by me and Mateo! MC: Currently I’m spending a lot of time from home working on gaming projects but hope to get into the comic book world on a full time basis. I have been working on two stories that are formatted for a new digital reader that my colleges have been developing with me. Please feel free to track my work at www.mateocantudesign.com with future comics being developed and with Paper Dream Productions. Now that Uncanny Adventures has debuted, we’re going to take a few minutes to continue speaking with some of the great creators in our anthology to give you a taste of what you can expect. Drezz Rodriguez is a Canadian cartoonist whose pages with Andrez Bergen are dark, moody, and visceral. His work for Uncanny Adventures — “Zig Zag” — set a dark noir tone by matching static illustrations with the text. My name is Drezz Rodriguez, and I’m a creative director by day and an illustrator by night. Born and raised in Sudbury, Canada (about 3 hrs north of Toronto) I’ve been authoring comics since I was a teenager but didn’t really get into the webcomics game until 2010 with the release of my neo-noir online graphic novel, El Cuervo. I’m also a contributor and a podcast personality over at the Webcomic Alliance. It’s an odd story, but it basically started off with a kid who lived across the street from me. He was a master swindler who would con younger kids out of their toys and sell them on the schoolyard. He ripped me off, his mom found out, and as compensation, I got a half-full longbox of comics – most notably, the Frank Miller run of Daredevil comics featuring the death of Elektra. That opened up my eyes to what comics ‘could’ be instead of the standard Archies and Richie Rich comics I was reading at the time. I felt it was something I wanted to do to – but struggled to find the resources to do it. I was always more into alternative comics outside of the superhero mold, so I read a lot of Heavy Metal, Love and Rockets and Hate Magazine. They helped to influence my style and tell stories that showed the rotten side of humanity rather than following the formulaic ‘good guy wins out’ method. Simple really – it’s a short story that takes place in one room, so I focused more on dramatic lighting to keep that sinister feeling. My style lends itself well for a story with this type of exposition. For comics, I’m actually diving back into my collection just to keep the gears oiled up. I finished reading Ball Peen Hammer by Adam Rapp, and I’m currently reading Garth Ennis’ Preacher – the ‘Gone to Texas’ trade. It’s been years since I read it and wanted to get reacquainted with it. For regular reading, I’m actually juggling two books. The first is Stephen King’s 11/22/63 about the JFK assassination, and the other is an e-book version of Ian Fleming’s Casino Royale. I have the entire collection on my iPad and wanted to see how it holds up in the modern era. I actually have a little James Bond comic project I’d love to work on in the future, but that’s for another time. Andrez actually gave me some good praise on my webcomic, and I’ve given a read to some early drafts of his work. We’ve struck up a friendship over e-mail since our tastes in literature and visual styles are similar. He asked me if I wanted to contribute some visuals for Zig Zag, and I happily obliged. I’m looking forward to future collaborations. Right now, I’m opening up a digital portrait commission site called Avatar Noir (www.avatarnoir.com), working on the second and third acts of my latest story arc for El Cuervo (www.el-cuervo.com), and I have a few other comic projects I’d like to get off the ground conceptually before year’s end. I’m also in the midst of working on an online based crime-noir game set in the 80s called ‘The Fix’ with no scheduled release date as of yet.